GeoLITE (Geosynchronous Lightweight Technology Experiment) is an advanced, experimental communications satellite featuring Laser and UHF communication devices. It is operated by the NRO. GeoLITE is the first mission for TRW’s T-310 satellite bus, a new lightweight, highly stable platform capable of a range of missions. TRW has system integration responsibility for GeoLITE, including the satellite development, integration and preparation for launch. 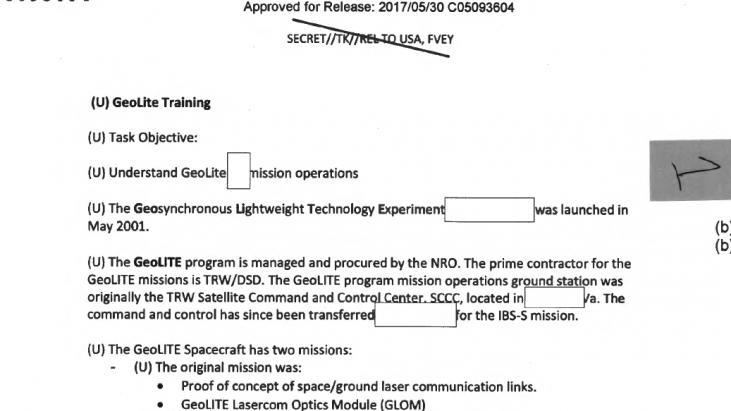 the GeoLITE Laster Terminal (GLT) to provide the NRO with information concerning high data rate geosynchronous orbit to ground communications in varying atmospheric conditons. It provided data to refine models and systems to reduce costs, riskas and schedule for future operational lasercom systems. The UHF payload was part of the IBS-S (Integrated Broadcast Service – Simplex) inteligence data dissemination architecture to replace the older military satellite communications (MILSATCOM) archtecture. Other IPS-S payloads were flown on different missions to provide geostationary and polar coverage. The satellite was designed and built in 3 1/2 years using streamlined program methodologies. The below document was referenced in the Intellipedia Entry for GeoLITE. 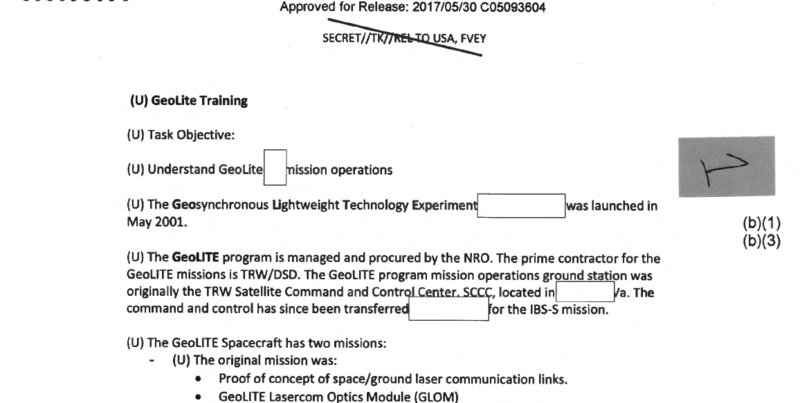 After more than a year, I was able to get the document declassified, and it is now available here, for reference.